Captain Effingham: "Steady on an' listen to what Bill an' Jim have to say, you lot." Colonel Devereaux: "Major Hicks, Sir. I dare say we are getting somewhere now." Major Hicks: "I do believe we are General. The plan is coming along splendidly." 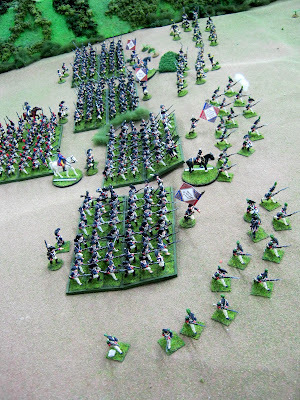 Rules: Batailles de l'Ancien Régime adapted for Napoleonics. Scale: Several brigades per side. Tabletops: Main table plus two back tables; one per army. Our intent is to place the player in the role of a regimental commander of infantry or cavalry dealing with all the tactical problems therein. 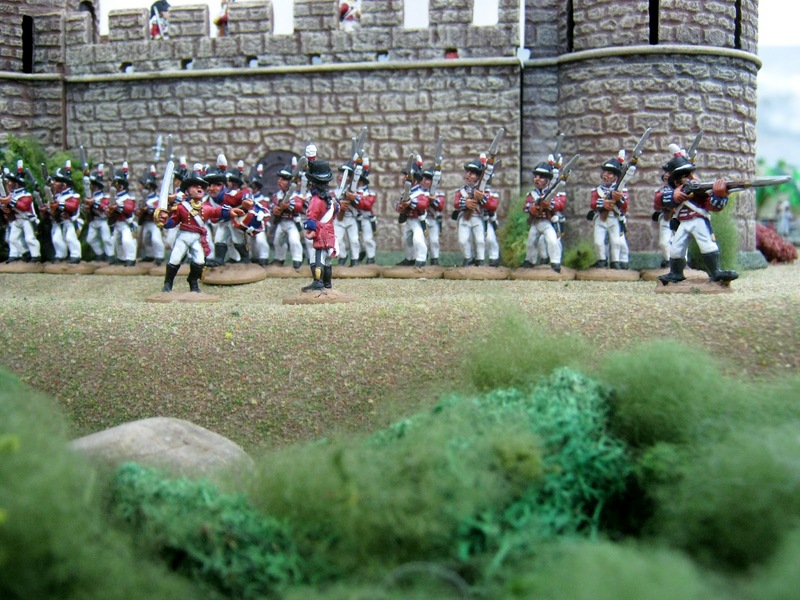 Half of the newly arriving 9th Regiment of Foot, the East Norfolks nicknamed in Spain as The Holy Boys. Elite Miniatures plus a few Foundry officers. inland to the main army. Foundry Miniatures. Significant maneuver and marching room. Terrain obstacles but too much bogs down play/enjoyment. Tactical problems germane to historical locations. Easy attrition from game to game with reinforcements and returning wounded. Blog background stories, AARs, vignettes and personalities. The plan is to not have games with dozens of units per side. 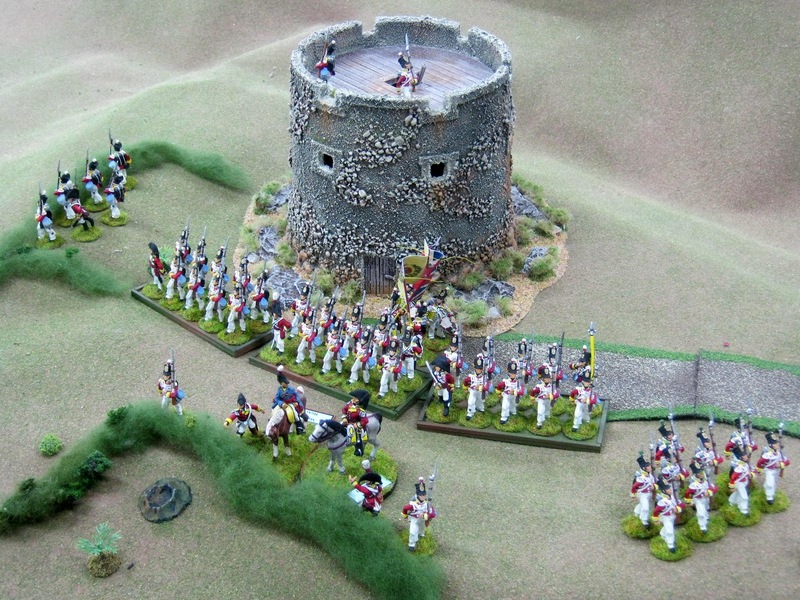 Players invited to raise one unit. More is a personal choice. 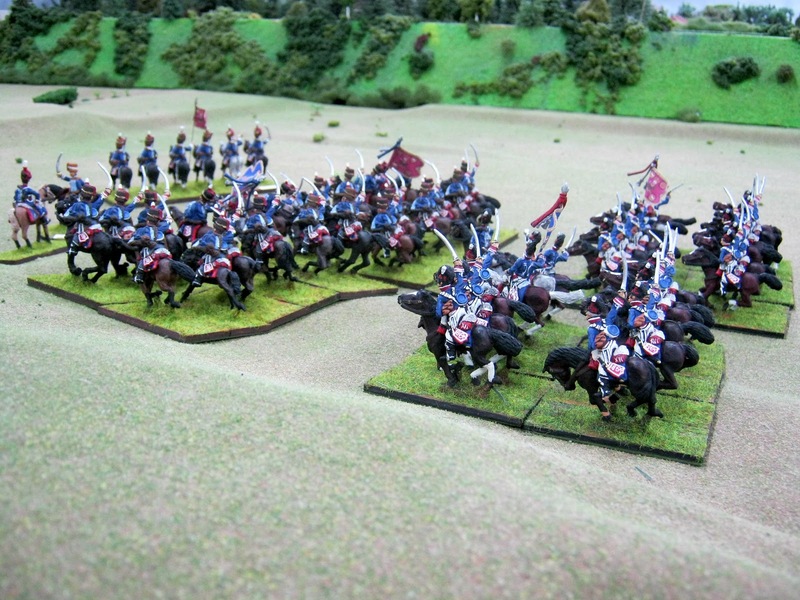 Lord Henry Paget's Light Cavalry Brigade; 4 1/2 squadrons. 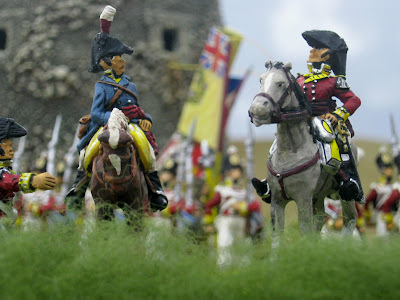 Mostly Elite Miniatures with some Front Rank. Recommended company strength: 10-12 miniatures. Recommended squadron strength: 12 miniatures. No need to raise units at full paper strength or slightly higher though we can. French Battalions: We are using the later structure of six companies. British Battalions: Ten companies at 100 men each. However, it might be easier to think of each two of the eight line companies as a grand division or to say several companies are on detached service. This way the daunting idea of raising a battalion of 100 miniatures is made more palatable at 50-80 miniatures. 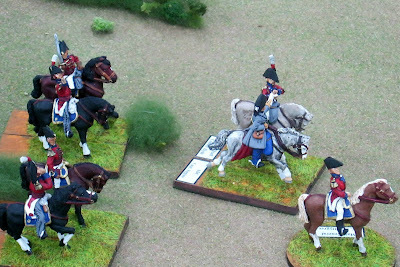 Cavalry Regiments: Two squadron minimum recommended. Horses: 1" frontage. Depth as needed depending on horse length. People on foot: 3/4"x3/4" squares or 3/4" fender washers with a 1/8" hole in the middle. Generals and the like: 2" circular bases. Major General William Justinian Pettygree and staff. Pettygree: "Well Gentlemen. Here come the French." 1) The above collection is Bill's. 2) Jim has a British line battalion, several rifle companies and an almost completed RHA battery with limbers. 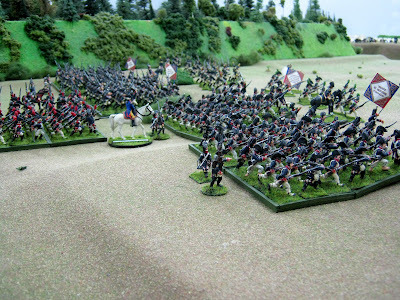 He also has a French Brigade of infantry. 3) More miniatures for 12 May? Naturally! Bill: Finish the 9th Foot and receive two rifle companies from a friend painting them. 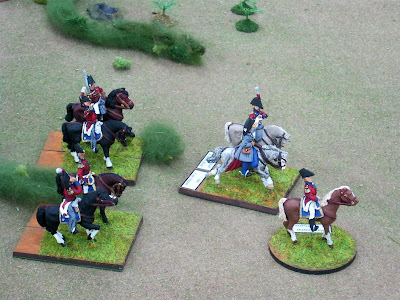 Jim is thinking about finishing his RHA battery and possibly adding French lancers. Curt has started a French officer and hopes to next do several squadrons of French Chasseurs a Cheval. Bon! 4) This is a perfect project for local and regional pards to raise one unit to join the fun; a battalion of infantry, heavier cavalry than shown above, something from Portugal or Spain, etc. Perhaps something missing from our collections; a gap needing to be filled? A splendid array already and I'm very much looking forward to the story unfolding. Great idea! I'm sure it will be fun. 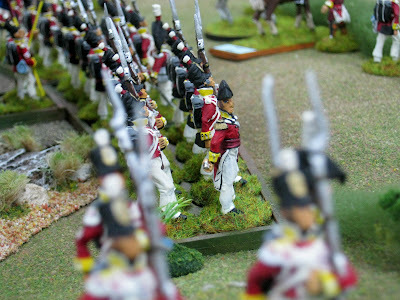 Each person bringing a small number of units to the games, give a sense of 'personal' command. Too early for a Portugese Tiradore company of the Third Trancoso Cacadore Battalion? They did not exist until 1809? Pleasantly surprised to see you depart from the 1" bases. 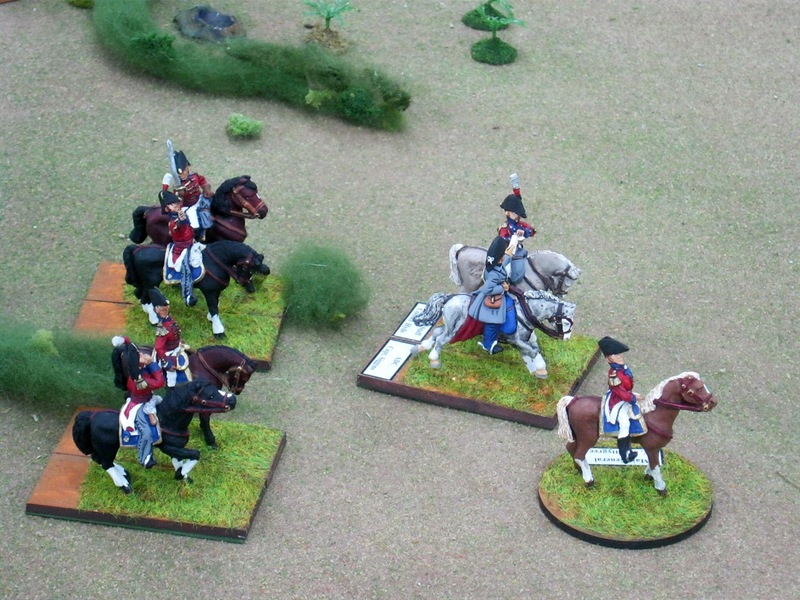 I may have painted troops available now given that. Thank you for your remarks and good wishes sirs. Alan, I've always thought bringing a unit or more to games is a good thing. As you say it is a personal command. It also means being a part of something as a personal investment in the project and certainly is fun. I often offer to bring something to away games other friends host, if I have something and it works for the host. Prinz Geoffrey, Any units are welcome though they were not present historically. Jim often mentions Portuguese and Spanish. We have none presently. We wish we did. I am sure they will march in some day. Michael, bon! I'm glad to learn there may be something. Like the look of this looking forward to more!